A good vintage ring is a fantastic item to have -- elegant, shiny, retro and gorgeous! And you can use it to top off so many different outfits, just to add a bit of extra glamour. But wow, what a difference that can make! From a cute, shiny vintage ring with a flower in faux strass stones, to one with a more funky design based on the 60’s; here in the TopVintage boutique we picked out the most beautiful retro rings! Do you feel like your outfit could use that little something extra? 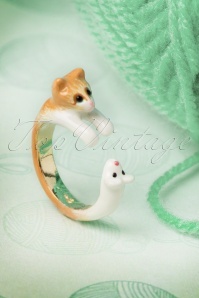 Get one of our lovely and elegant rings, because they’re gorgeous accessories that light up your whole appearance! Whether you combine it with your dress for that extra classy cocktail party look, or with your jeans, shirt and cardigan to add that chic 40’s or funky 60’s touch, find out which vintage ring suits your style, personality and wardrobe in the best way! 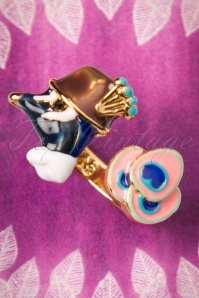 The designs of these rings are timeless, so you’ll surely be happy with your retro ring for a long time. There’s more good news: if you order more than €250 worth of merchandise, we’ll ship your order for free. That’s great in case you’d like to buy some of our other items! Do you want your order to be delivered anywhere outside of these countries? No worries, our international shipping service goes for many different countries, and it’s super fast and secure! Did you find your perfect ring and you’re wondering if it’ll fit? Our rings either come in one size, or they’re adjustable. We also made sure to mention each ring’s measurements in the product details. This way you’ll be sure your vintage ring will fit, and you’ll shine bright like a diamond!